ST. FRANCIS, Wis. (CNS) — Bishop Oliver Dashe Doeme of Maiduguri, Nigeria, sat quietly in a room at St. Francis de Sales Seminary in suburban Milwaukee as he listened to his assistant, Father Gideon Obasogie, also from Nigeria, recall a story of one parishioner, a young boy. The boy was taken by Boko Haram, an Islamic extremist group, and was gone for four days. “The Boko Haram never touched him. He had the strength somewhere,” Father Obasogie said in an interview with the Catholic Herald, a publication serving the church in southeastern Wisconsin. Father Obasongie said the boy was threatened with knives and guns. While listening to this story, a single tear slowly descended halfway down Bishop Doeme’s face. This was a happy story, but it also was a rare story. 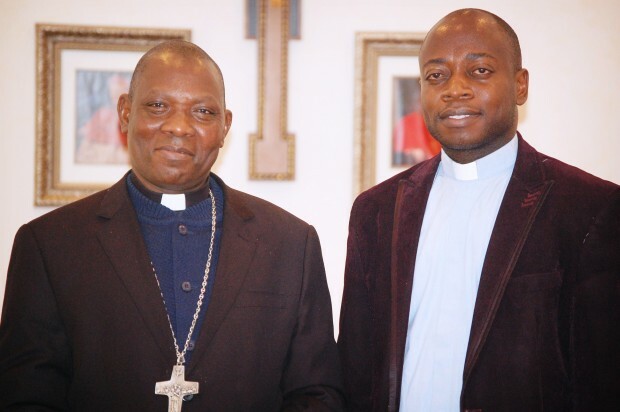 Bishop Doeme, 55, a native of the Nigerian state of Plateau, has been working in the Diocese of Maiduguri since 2009, and has had to deal directly with Boko Haram. “Since its emergence, it has been one attack after another on the church, on individuals, families,” Bishop Doeme said. The bishop, who was in Milwaukee to speak at the 10th annual Men of Christ Conference March 12, said it’s been difficult for the military to fight the terrorists. The fighting between the government and the group has had a profound impact on the diocese. Bishop Doeme said when he was made a bishop in 2009, there were more than 125,000 Catholics in his diocese; now there are fewer than 70,000. Bishop Doeme said more than 25 priests have been relocated to other parts of the country and neighboring towns to continue their ministry. With the diocese under attack, Bishop Doeme has become accustomed to handling the anxiety. He said that, as a bishop, his job is to face the threat head on. The most famous incident involving Boko Haram in the Diocese of Maiduguri is known in the United States as “Bring Back Our Girls.” According to the site www.bringbackourgirls.ng, Boko Haram terrorists abducted more than 270 schoolgirls from the Government Girls Secondary School in Chibok April 14, 2014. “Most of the girls that were taken were Christians and I hope they’re still Christians,” Bishop Doeme said. He added that they continue to pray for their release, though so far only 56 girls have returned. In 2014, Bishop Doeme claims he had a vision of Jesus Christ during eucharistic adoration. Bishop Doeme said prayer will eventually defeat the terrorist group. As for the vision itself, he doesn’t focus on it. During their visit to Milwaukee, Bishop Doeme and Father Obasogie hoped to raise awareness of what’s been happening in their diocese. They were asking for prayers and for financial contributions to be sent directly to the diocese. There are rays of hope that come as the government continues to fight Boko Haram, he said. One of those places was the previous parish of Father Obasogie, who was heartbroken when his parish was overtaken. Father Obasogie said the diocese receives reports from priests when there are attacks. The fighting has resulted in the deaths of hundreds of Nigerian Catholics. Torres is on the staff of the Catholic Herald, a publication serving the Catholic Church in southeastern Wisconsin.